The Harkey House is a creamy yellow, classic Italian Victorian, built in 1874 as the home of the Sheriff William Harkey of Sutter County. In the back area, there is a wonderful brick patio with willow furniture, umbrella tables, and a covered trellis providing shade. A spa and mediterranean pool add to the courtyard. The Country French Dining Room has a black and white tile floor, fireplace, fountain, oriental rug and high paned glass windows. The Living Room and Parlor share a marble fireplace, comfortable seating, original artwork and crystal chandeliers. Each guest room has a different theme and ambience and the entire house is fresh and inviting. Note that this is a great spot to honeymoon as well. 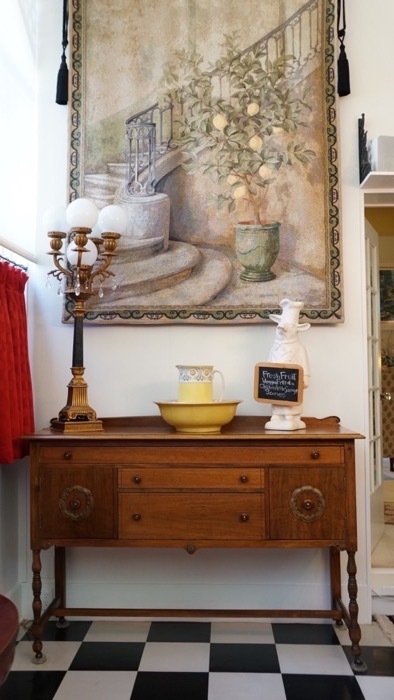 Successive visits will uncover new and enchanting details that add to the Inn's appeal. At the Harkey House, we have earned many rewards by providing exceptional service for our wonderful guests to make their stay relaxing, rejuvenating and memorable. 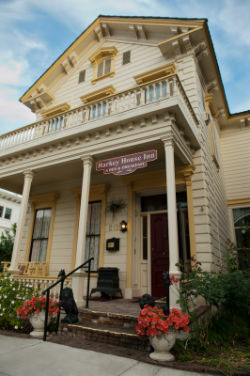 The Harkey House Bed & Breakfast has hosted travelers from as far away as Japan, Scotland, Belgium, England, Canada, Burma, and Zimbabwe, and from as near as the San Francisco Bay area. This 1874 Victorian makes an ideal location for a honeymoon or a romantic getaway. Breakfast at the Harkey House is served in the beautiful French Country Dining Room. This is set on a lower level than the rest of the house, which makes it larger and gives a sense of detachment from the immediately surrounding rooms. The black and white tiled floor, soothing fountain, antique French Country hutch, pellet stove and elegant chandelier create a sense of the Provinces. Breakfast is an intimate and tasty affair, with lavender scones, Belgian waffles, frittatas, chicken apple sausage all made by the host and hostess. The Harkey House is even more a haven from the outside world in this light and airy room, filled with beauty, delicious food and good company. Vegan and gluten-free options are available. 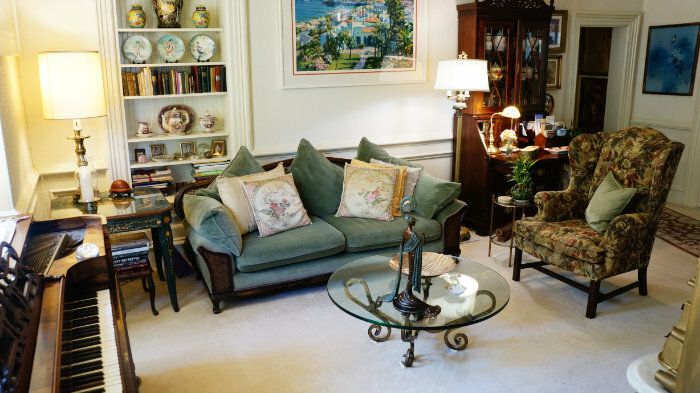 The Living Room houses a memorable collection of ornaments and furnishings placed to enhance serenity. Many curious and exotic pieces, including an Erté sculpture, heighten the room's luxurious air, at the same time enhancing restfulness. Tasteful, sensitive floral arrangements as well as the beautiful crystal chandelier foster a pleasant and elegant atmosphere. Of particular note, in this room rests an unusually well-traveled antique Chickering Rosewood piano. The stately instrument has traveled around the Cape Horn and represents the countless lovely components of the Living Room. 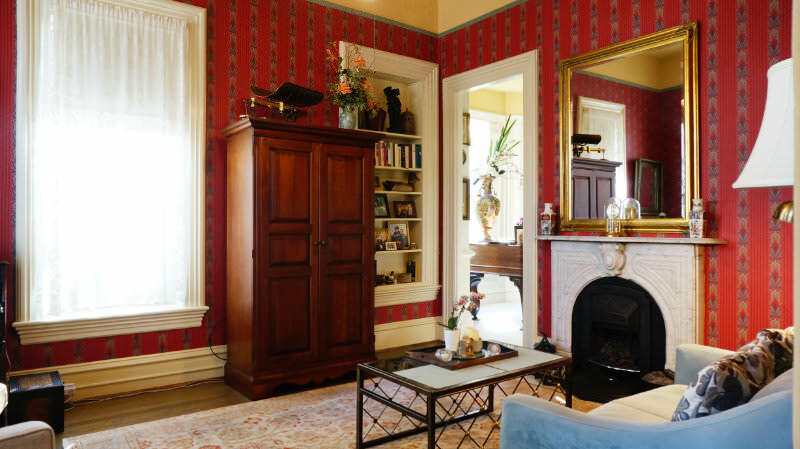 This room also exemplifies the Victorian architecture evident throughout the house, which is particularly apparent in the bookshelves and entrance to the Dining Room. A stunning Italian game table adds to the room's captivating look and feel. This elegant table has the ability to change into a chessboard or a board for backgammon and other games. The Parlor, closest to the Harkey House entrance, suggests contemplation and solitude. A sense of history and calm pervades this room, playing over the books, the lush scarlet wall papering, chandelier, and the original marble fireplace. Trimmed with cozy, antique furniture and efficient, handsome fixtures atop the original fir floor, the Parlor lends itself to introspection. William Pinckney Harkey was born in Illinois on February 6th, 1832. He headed west with Clarinda Tennis in 1854. They were married in St. Joseph Missouri and arrived in Marysville on July 31st of the same year. The couple had six children, of which only two survived to adulthood. Harkey became successful through running teams of pack mules, which enabled him to purchase almost two thousand acres of land in the Yuba-Sutter area. In 1873 Harkey was elected Sheriff of Sutter County. Sheriff Harkey kept his position for seventeen years; he also sat as the head of the Agricultural Horticultural Society and became an increasingly respected pillar of the community. In 1874 the Sheriff built his home right across from the courthouse, Harkey's 'special hotel' for lawbreakers. William Pinckney Harkey died in 1906 at age 74. After Clarinda Harkey's death in 1919, the house was sold to Julia Lazendorf (a Latin, math and science teacher) and her husband, who owned the home for thirty years. Every year the Lazendorfs hosted a Roman banquet in the dining room for Latin students at Yuba City High School. In 1955 Sid and Elsie Smith purchased the house, and in 1971 Jim and Lee Limonoff became the owners. Lee still owns the house with her husband Bob Jones. Lee and Bob have carefully preserved as much of the original house as possible, from the marble fireplaces, chandeliers, shutters, pedestal sinks and the screen door, to the blown glass windows. Other aspects of the house have changed, which adds to its uniqueness. 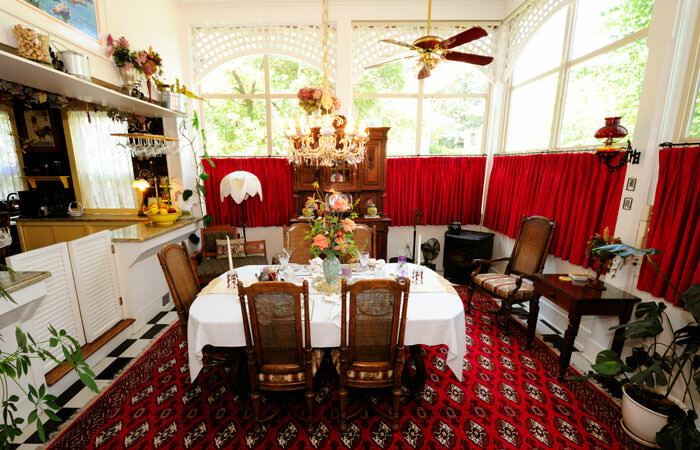 For example, the Country French Dining Room was once a sun porch. The Tuscany Room was added in the late Fifties.